This topic contains 66 replies, has 28 voices, and was last updated by steven 5 months, 3 weeks ago. What do you use your E RIDER for? Write a brief introduction about yourself here. I’ll kick this one off. My name is Ken Ferguson and I’m a Director of E Rider. I live on the Wirral and I mostly use my E Rider to go to Sainsburys. It’s about half a mile away and although I can go faster in my car being able to park right by the door is so much more convenient. I also use it for going to visit friends locally and riding on the Wirral way which is a cycle track going right round the peninsula. Driving silently alongside the beach on a nice day is gorgeous. I am Malcolm Saunders. I am also a director of E Rider and live in Wirral. I use my E Rider almost every day. I go to the post office and local shops as well as going for pleasure rides all round the area. Occasionally a high powered cyclist will overtake me as I travel along the bike lane at about 15 mph. I don’t mind that at all. I am sitting comfortably on my large, scooter style seat and enjoying my surroundings. If I want a bit of exercise I can pedal, but I don’t do that too much because I have an arthritic knee and I wouldn’t be able to get very far on an ordinary pedal bike. The E Rider gives me a huge amount of freedom of movement without the fuel costs of taking the car. I have got no doubt that the future of transport is electric and a big part of it is going to be on two wheels. Low cost, environmentally friendly electric scooters reduce congestion and pollution at the same time as being really easy and comfortable to use. My name is Jan Longworth. I live in Sunderland, Tyne and Wear. I have been riding a Claud Butler Glide 2 Electric Bike for the past year. The bike has been great but unfortunately I suffered a couple of punctures recently . I saw an advert for the Erider whilst browsing Electric bikes on Ebay a few days ago. After accessing the dealers web site and looking at photo’s on Facebook I phoned the company with a few questions. The Gentleman was very friendly and helpful. As a result I have ordered a Scooter but have not yet taken delivery. Hello my name is Jim Mills. I live in Lincolnshire and I am retired. I do voluntary work for a few hours each week. Until now I have used the bus because it is free with my bus pass, but the buses are not at the best times for me and I have to walk quite a long way to the bus stop. I saw somebody riding an E Rider and I was so impressed with the look of it and how comfortable it looked I searched for it on the Internet and found the website. The bike has arrived and will put it together this weekend. I will let you know how I get on. Having placed my order for an Erider but yet to take delivery I would like to know your impressions once you have assembled it and ridden it. Also how difficult is it to assemble and how long did it take you? Good question. I will write a few words and put it on the review section later on. One of our customers has made a video of the assembly process which might help and give you a feel for what’s involved. You can see it here. I haven’t bought one of these yet, but I am interested. I ride a bike now and I want to know what other people think about moving over to an electric scooter. I have had a really good look on the Internet now. Your website gives the best information. Actually most sellers don’t seem to have a site, they just sell on eBay. And I think your bike looks the best as well. I have definitely decided to buy an electric scooter, but there are still quite a lot of things to think about. If I buy a tandem one it seems like I might get a longer range and they have a switch to go faster than 15 mph. I know I’m not allowed to do that on the road 🙂 but it might be nice to have. It’s hard to know which is the best deal. Thank you for sharing your thoughts with us. And thank you for your kind comments about our website. 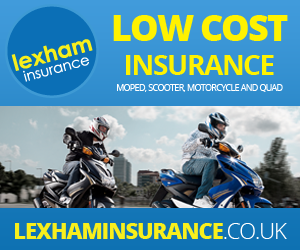 We specialise in electric scooters so we know our product and we are able to provide advice and support if you need it. We also keep a full range of spare parts in case you get anything damaged and, of course we give a full two year parts guarantee on the bike and one year warranty on the battery. Although the E Rider is the lowest cost, powered transport you are likely to find it is still a big buy and you should make sure the support you need is available. As far as I know there are not any genuinely tandem electric scooters in the UK market. If you look at the pictures of the E Rider you will see that it has a seat which can take two people and it has rear foot rests. This is the same as the ones which are calling themselves tandem bikes. The reason they claim to be tandem is because they weigh more than 40 kilograms which is the maximum allowable weight for a road legal electric bike in the UK. A genuine tandem is allowed to weigh a bit more, but for a bike to be a tandem it needs to be capable of being pedalled by both riders. A bike with one set of pedals is not a tandem, it is a bike which can carry a passenger. If you have a switch or cable connector that allows your bike to be powered faster than 15 mph it is illegal even if you don’t use the extra speed at all. The bike must not be capable of being powered faster than 15 mph. You said that our bike looked the best Alvin. Well it is the best, and it’s legal, and it is incredibly good value. Apart from that we give you support rather than forget you as soon as we have got your money. Make your decision soon and thanks for talking to us. Thanks for the video showing the bike being built up. It certainly will help me and looks an easy job to do even for me, a retired woman. Thanks for your help, I can’t wait for delivery and getting up and riding. I will post how I get on with both assembly and then riding. I am getting quite excited. Hello All – I’ve had an E-Rider since May and it’s a big hit with the family. Living about 5 miles from Cambridge I’ve been into town on the E-Rider a number of times including when the Tour de France came to town! My teenage kids use it as well to go to the local shop and town sometimes riding tandem. The E-Rider is useful for when you don’t want to work up a sweat or just need to grab something that can be carried in the useful storage compartments. We are all active people with mountain bikes and road bikes which we use regularly but the E-Rider is a good alternative if you don’t want to don the Lycra. I recently rode the E-Rider back from the next village along the cycle path only to find a woman driving her car and hanging out of the window recording me on her phone! I can only suspect she thought I was on a moped and therefore driving illegally on the pavement or she thought I was cool. Either way she probably needs to get out of her car and onto an E-Rider to make the roads safer…………. I’ve had some nasty comments from both pedestrians and cyclists over the past week or so since purchasing an Electrically assisted Pedal Cycle. I even got stopped by the Police today . 1. Both Pedestrians and cyclists haven’t a clue as to what an EAPC actually is and seem to think abuse is justified whilst riding. There is a lack of understanding caused by ignorance. Most people seem to object to my riding in Cycle lanes. I received a load of foul language today whilst riding in a cycle lane from a cyclist travelling in the opposite direction. 2. I got stopped today by Police for not displaying a number plate. When I tried to explain the law to the Police officer he became extremely rude and asked me if I had been drinking. I explained that I was a teetotaller yet he asked me for a breath test. Upon discovering his machine was out of date he asked his colleague if he could use his but his colleague did not have one on him. He then asked for my driving licence to which my response was this is not a legal requirement for an EAPC. He contacted control for advice. He did not then pursue the subject of Number Plates or Driving Licences again but instead stated he was issuing me with a warning. Needless to say I am submitting a complaint regarding the Police Officer’s totally unjustified actions. 3. It appears to me that both the public and especially the Police need educating as to the law regarding EAPC’s. It is a sad indictment of our over regulated world that some of our fellow citizens feel the need to convey their moral superiority by seeking to enforce any minor infringement they perceive in the behaviour of others. Even when that perception is entirely wrong!!! It seems to be a fairly common human trait however- I believe during WW2 some Germans turned members of their own families over to the Gestapo… in other words ignore them, they’re idiots. Regarding the police incident, I think you have been unlucky to be stopped and by such boorish specimens. Driving any vehicle on the road risks being stopped by Traffic Police and I don’t believe it is particularly common to E bike owners. I’ve been driving my E RIDER for six months without incident and I don’t wear a helmet. It is worth pointing out that even if their breathalysers had been working you would have been quite entitled to refuse to blow into it. That law only applies to drivers of registered vehicles. I wish you success with your complaint.